« Were You On The Sqn in November 1993? Many will already have heard from other sources of our sad loss of Bugs Bendell. Because of the rather special sortie link I had with Bugs in 1958 I am sending this out with a rapid career summary at the attachment, mainly cobbled from his book. The funeral will take place on Thursday, 19th January at 12 noon at Amersham Crematorium in the Milton Chapel. The Chapel doors will be open from 1130 to enable you to wait inside until the service. Afterwards at the Officers’ Mess, Air Command, RAF High Wycombe. We all owe much to Jules (Juliet), Mrs J Bendell, whose family support given to Bugs during his courageous life with Multiple Sclerosis has been so outstanding (and here too a tribute too for the two Star and Garter homes). We all share our admiration for Bugs’s courage and that of Jules, as their matched ‘never in anger’ response to their long later predicament. The Bugs we knew, both before and after developing MS, will be sorely missed. Bugs was trained in Canada on Harvards and T-33 after his enthusiasm for flying was kindled at Totnes Grammar School, its ATC and also a Tiger Moth flying scholarship, a background which made him determined to join up and not stay at Wellworthy’s in engineering. From RCAF Moose Jaw for Harvards (best student pilot award) – Jim Edwards was also there too & Ralph ‘Ces’ Poole – they then went on to RCAF Gimli (18 SFTS in WW2), Manitoba, near Lake Winnipeg, as AFS on the T-33 Silver Star. After 12 Hunter course he went to 67 Sqn (F Mk 4s) at Brüggen, which would be rapidly disbanded, post-Sandy’s Axe, in April 1957.Bugs was posted up to Jever on 4(AC) Sqn F Mk6s. At tourex, Bugs joined 66 (F) Sqn at Acklington with Peter Bairsto and then Peter Pledger as OCs, with 66 disbanding on 30 Sep 60. AFDS & Lightnings followed as a Flt Cdr on 111(F) at Wattisham, with their F1As arriving in March, 1961. 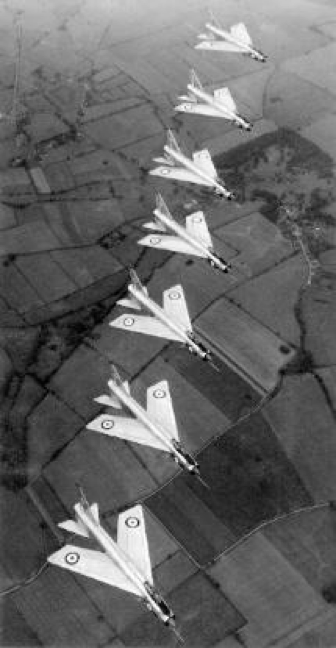 When display flying during that summer, after BofB on 20th September 1962 came the well known ‘600+ knots or so’ very low Bugsy flypast at Wattisham for some College of Air Warfare visitors . . . . ‘low ambient temps & therefore low speed of sound’ etc Bugs pleaded. [While at it though . . . . Could none of the Lightning or Phantom guys not have imitated the little known Hunter (part of it jollyy well could be supersonic in level flight!) similar trick when you could get quite a respectable sonic boomlet from the airbrake Hunter test switch applied at c.590kts & without any unreasonable trim change even at v. low level (full airbrake was definitely Not advised)? It was not that easy to aim it, as hitting the A/B test switch to plant the boomlet at exactly the right place & time at low level was not that easy . . . but this A/B mini-boom never ever shattered windows). Bugsy’s exploit was to leave some interesting damage to (a) lift OC Ops’ pre-fab roof with him also whie-spattered (b) leave Local Control as a shambles with 6 double plate glass windows shattered (c) an ex-WW2 Met man ‘never more frightened’ & (d) 41 Sqn’s line hut structurally altered as well. A senior Army officer visiting was heard to remark that ‘I must say, when the RAF put on a show, they certainly don’t spare any expense!’ A full round of apologies to the stn hierarchy had to follow, culminating afterwards with a final formal interview with the Stn Cdr, Gp Capt David Simmonds, who first harangued Bugs and told him that he had to report to the Air Ministry the very next morning! 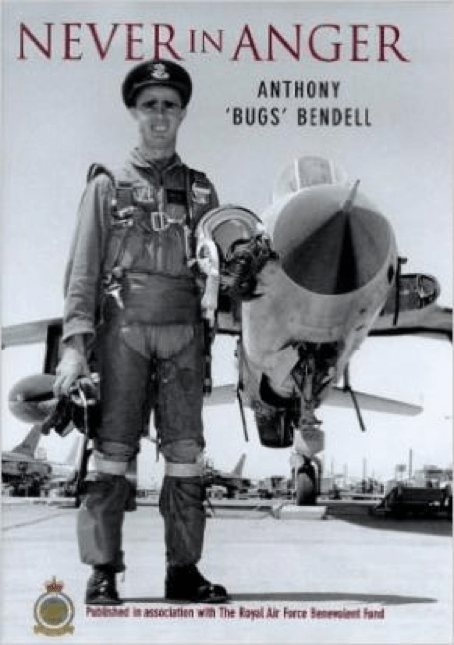 However the Stn Cdr ended up laughing at Bugs’s deep shock and protests – the nice touch was that DS then, with much laughter, said that this visit was actually for him to hear, for the first time, of his USAF exchange posting tour to Nellis AFB on F-105Ds! Tim Barrett was already over there too at the Fighter Weapons School but on F-100s. 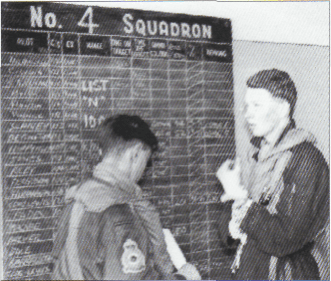 Fg Off Tony ‘Bugs’ Bendell being briefed during a Sylt APC by Fg Off Alan Pollock (in dark Rifle Brigade green dyed 26 (AC) Sqn flying suit), taken only a few days earlier before Bugs’s lost 7 minutes from anoxia on 28th March 1958, photo probably by John Hawtin – at one stage in 1957 after the Sandys Axe,the Squadron had its Commander Sqn Ldr Ray Chapman, Lt Parkinson RN and Flt Lt John Sutton (later AM Sir John Sutton KCB)s and 22 Flying Officers – a few months later with Sqn Ldr Tim McElhaw there were only two married men on the squadron aircrew strength, both slightly different mixes compared with today’s RAF! One of the other highlights in Bugs’s book occurred on 8 Oct 63, the few pages describing why and how he ended up at the top secret Groom Lake airfield on his diversion in there, when the futuristic shape of an early SR-71 was also seen parked there. This was when one of the two course students, in his section he was leading of three Thuds, had to be shepherded into there in an emergency. What followed needs the full original text to be read in the book! This passage is either side of the central section of 36 b&w photos & the book has a good index, where you will find many names that you know & knew. A high proportion of the F-105D pilots would be involved in Vietnam, also with their own high losses, 382 F-105s mostly to radar-laid AA guns, and many pilots POWs or among the overall 58,000+ total which US forces lost out there, killed and missing. Jock Heron would follow Bugs in that same instructional role at Nellis on Thundechiefs, as Bugs returned to UK – his new post was as Ops F1A at D Air Def & Overseas for 3 years, also meeting and marrying his wife, Jules (Juliet), at Stanmore on 17 Mar 66 (Stuart b.Ju l67 & Emma Aug 70). Handing over to Tim Elworthy, it was Manby refreshing in Sep 68 and on to be a Flt Cdr on 6 Sqn Phantom FGR2s at Coningsby (OCs David Harcourt-Smith & then John Nevill) until Dec 71 and in 1972 off for the Camberley Army Staff College among the 180 course members of which 50 were from abroad. HQ 38 Group’s Ops 3 followed at Benson, since 1972 in Strike Command, moved from Air Support Command & Odiham. At tour’s end & promoted Wg Cdr in July 1974 after ditching the Jet Provost refresher & again it was on via 229 OCU Chivenor and a longer Phantom course at Coningsby. He drove out by himself to take over as designate OC 17 Sqn at Brüggen from George Ord on a Sunday in mid August, 1974 – on that journey, however, after driving through heavy rain, he suddenly saw double of everything unless he closed one eye & driving thus he managed to make the station. Medics and a staff job as Wg Cdr Air Defence at RAFG HQ Rheindahlen followed. In December he was told that in October, 1976 he would take over as OC 19 Sqn at Wildenrath so now it was back, this time via Brawdy Hunters to Coningsby again and on to Wildenrath with Sqn Ldr Brian ‘Wally’ Walton as his pilot Flt Cdr. After HQ RAFG, and back again to 228 OCU at Coningsby, Bugs did more flying this time with 30 hours in 5 weeks to prepare him as OC 19 Squadron at Wildenrath and just three months to work up the Sqn so as to be able to take over the Battle Flight commitment by 1 Jan 77, with the Station now the first Air Defence base with hardened accommodation & Squadrons now with their own HASs. The CO at the base changed from David Leech to John Mitchell on 1st December. Station Minevals & Tacevals followed and preparations for the Queen’s Silver Jubilee Review at Finningley on 29th July, plus a fair number of Exercises & VIP visits. Eventually Bugs handed over the Sqn to Tim Gauvain shortly after Bugs clocking up his thousand hours on Phantoms but Bugs again was consulting the medics. A formal diagnosis at Wroughton of Multiple Sclerosis followed and a place on the Air Warfare College at Cranwell before his final 5 years at HQ Strike with his OBE awarded on 1 Jan 81 and increasing physical difficulties as Command Flight Safety Officer, with four visits to Headley Court and final retirement in June 1987. Now I hardly believe the arithmetic (but my memory is so clear on those Jever days – and Bugs’s large old BMW 501, once complete with visiting recalcitrant mouse therein, in his car or boot for three days!) that it is nearly 59 years since 28th March 1958 – both in our 22nd birthday month – when we so nearly lost Bugs. This was from severe anoxia, when his Hunter oxygen tube became disconnected after we had split out of sight and turned in for combat at 40,000 ft. Bugs was not easy meat & I knew his problem straightaway – he completely missed any recollection of those next 6-7 vital minutes, which felt all the time like a Hollywood epic I was watching as, in total dumb silence, he obeyed, very slowly, every instruction to the O2 reconnecting drill, wings levelling & on our safe 3 stage rapid descent through three thick cloud layers, with my only daring to turn him in the clear gaps, also while formating on him and doing the I/F for both of us down to his miraculous recovery, shortly after breaking cloud in our steep dive-braked angle below 6,000 ft over the sea, minutes from Jever, when now a hyper- alert Bugs cheekily resumed the lead but was watched like a hawk until his touchdown. This was before the rapidly introduced twin mods of the dog-lead clip and ‘stop any breathing’ mask if the tube became disconnected. We overlapped on 4 Sqn in 2nd TAF for 11 months. Our 122 Wing & later Jever Steam Laundry days (& getting Bugs down/up those precipitous stairs in his chariot at Holborn’s “Three Compasses” pub were never forgotten, in chats on visiting Bugs at Richmond and Surbiton.